Gluten Free Bierocks | Great gluten free recipes for every occasion. *If you prefer, instead of allowing the dough to rise slowly in the refrigerator as directed in the instructions, you may make and use this dough on the same day. It will not be as easy to handle, however, but you can work with it. To use the dough the same day it is made, after making the dough, set the covered dough to rise in a warm, draft-free environment to allow it to rise to double its size (about 1 hour). Once it has doubled, place it in the refrigerator for at least 15 minutes or until it is chilled. This will make it much easier to handle. Then, continue with the rest of the recipe instructions. Prepare the fillings. In a large, heavy-bottom saucepan, sauté the ground beef and onions over medium-high heat, stirring occasionally, until the beef is browned and the onions are translucent (about 6 minutes). Add the minced garlic and salt. Cook, stirring occasionally, until the garlic is fragrant (about 3 minutes). Transfer the cooked ground beef, onions and garlic to a small bowl and set aside, draining any excess fat from the beef. Place the pancetta (or bacon) in the saucepan and cook over medium-high heat, stirring occasionally, until the pancetta is browned (about 3 minutes). Add the cabbage, Worcestershire sauce, then cover and cook until the cabbage is wilted (about 3 minutes). Add the caraway seeds and mix to combine, then transfer the cabbage and pancetta mixture to a separate bowl, draining any liquid. Set aside. Prepare the dough and the bierocks. Line a large rimmed baking sheet with unbleached parchment paper and set it aside. On a lightly floured surface, divide the bread dough in half, then divide each piece in half again until you have 8 equally-sized pieces of dough. Work with one piece of dough at a time, covering the other pieces of dough with a moist tea towel to prevent them from drying out. Sprinkle each piece of dough lightly with flour as necessary to prevent it from sticking to the surface, and roll it into a round about 6 inches in diameter, rolling the edges of each round a bit thinner and keeping the center of the round a bit thicker. 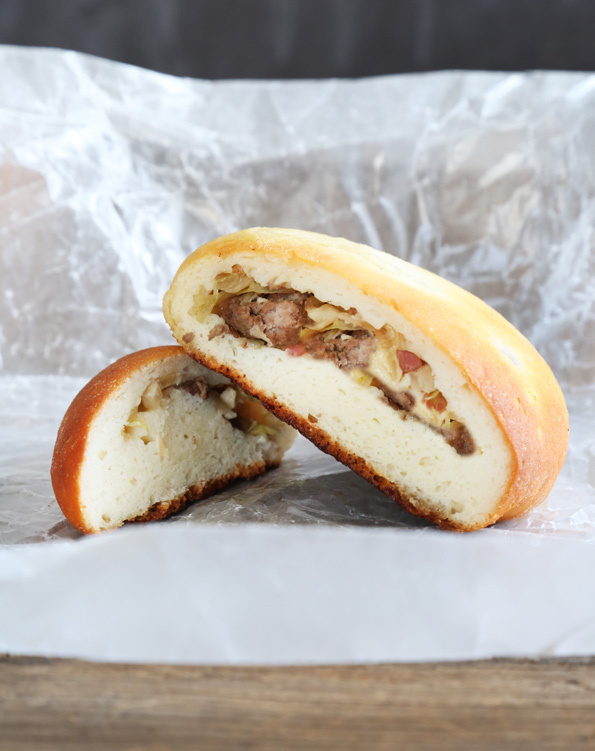 Top with about one-eighth of the cabbage and pancetta filling, and one-eighth of the beef filling, placing the fillings in the center of the dough. Pull the edges of the dough toward the center, overlapping the dough. Pinch to seal, then invert each bierock onto the prepared baking sheet, about 2 inches apart from one another. Repeat with the remaining pieces of dough and filling. Dust the tops of the bierocks lightly with more flour and cover the baking sheet with lightly oiled plastic wrap. Place in a warm, draft-free location to rise for about 45 minutes, or until the bierocks have swelled to about 150% of their original size (you will not see a full doubling because of the fillings). Turn on your oven to preheat to 350°F. Bake. Remove the plastic wrap and brush the tops of the risen bierocks generously with the melted butter. Place the baking sheet in the center of the preheated oven and bake until the bierocks are golden brown all over (about 15 minutes). Remove from the oven and serve hot or allow to cool completely, wrap tightly in freezer-safe wrap and freeze in a single layer on a baking sheet before transferring to a freezer-safe zip-top bag. Unwrap, allow to come to room temperature and reheat in a toaster oven at 250°F until warm. Adapted from Allrecipes.com, as chosen by you from my Must Make Gluten Free Pinterest board. P.S. Which Gluten-Free on a Shoestring cookbooks do you have? There are 3, soon to be 4! The fourth is Gluten Free Classic Snacks, and we’re gonna talk about it more very soon!